The residual strains in the composites of nickel oxide (NiO) and yttria-stabilized zirconia (YSZ) and in the cermets of reduced nickel (Ni) and YSZ, which were used as anodes for solid oxide fuel cells (SOFCs), were measured using X-ray diffraction. The influence of Ni reduction on the residual strain was evaluated. Tensile and compressive residual strains caused by thermal strain were observed in NiO and YSZ phases, respectively. They clearly depended on the volume fraction of NiO and YSZ, and changed proportionally. The YSZ phase in the Ni-YSZ cermets also showed a similar dependence on the volume fraction of NiO. The compressive strain increased as the NiO increased; however, a local maximum was observed for NiO 50 vol%, beyond which it decreased with increasing amount of NiO. Compressive strain in the YSZ phase in the Ni-YSZ with NiO of 60 vol%, which is a common volume fraction of SOFC anodes, was only 30% of that in the NiO-YSZ. 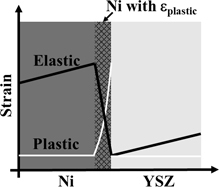 Plastic deformation of the Ni phase near the interfaces, and relaxation of the compressive strain in the YSZ phase were responsible for this phenomenon. This revealed the difference in the residual strain in the YSZ phase after reduction.